Online shopping has been one of the most authenticated ways of adapting to digital changes in the existing world. It has open gates for the people to easily shop for the requirements to even luxuries over the websites offering them. It is like buying “pin from plane” on the web portals with thousands of products sold at lesser rates than the market. 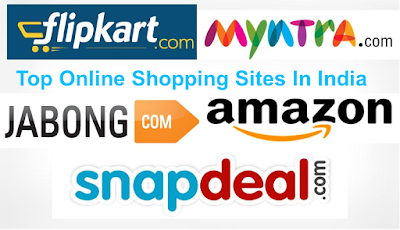 Basically speaking, online shopping sites have provided an extended help to people, who do not get time to roam around for shopping because of their hectic schedule. In the world of competition, a variety of online portals have been proving their worth. Amazon, Flipkart, Shopclues, Myntra, Sna Deal, Jabong, and Ebay are some of them to be noted. Being the top online shopping sites in India, they offer high quality products at discounted rates. Every season rates drop further because of discounted deals. This makes the customers happier as they can buy products that were not in their budget before. Stated to have highest number of products and founded on July 5, 1994, Amazon was found by Jeff Bezos in the Seattle town of Washington DC of United States. As an efficient ecommerce web portal, it offers a wide array of products that might not be available elsewhere. And the most essential thing about Amazon is that it offers quality stuff to the customers. Serving with the node of quicker delivery, it has managed to gain high-end reputation in much less time with enormous variety of products to sell. A name no less than its counterpart online shopping sites, Flipkart is a renowned place to shop extensive amount of products. Offering an authenticated option of enjoying exclusive products, it was founded by Sachin and Binny Bansal in Bangalore city of Karnataka. Adding to its reputation is Flipkart offers and sale that are beyond imagination. With so many products offered at affordable rates, the company has managed to build goodwill for consecutive years. Making payments and receiving money smarter than ever, Paytm has gained recognition immediately after the flagship of demonetization. Though, in the market from August 2010, it has been active in making cash transactions through smartphones. Not just restricted to this; people can shop anything and pay from their paytm account that also includes clearing off mobile or utility bills. Synonymous with quality and affordability walking together, Shopclues is a perfect website to enjoy quality products ranging from clothing to fashion accessories to shoes, bags and lots more. With Sanjay Sethi as its founder and headquarters based in Gurugram, Shopclues has come a long way from being a plain online shopping website to quality service portal. In fact, it was founded in July 2011 at California’s Silicon Valley. With more than 2 Lakh products on its roll, customers have extensive amount to select from. And of course, one can find just about anything on Shopclues in terms of fashion. An ecommerce platform worked towards carving a niche in the business, Myntra is a name on every buyer’s list. Founded by Mukesh Bansal, Ashutosh Lawania and Vineet Saxena, Myntra is a fashion ecommerce options for people believing on mingling style with comfort. Headquartered in Bengaluru town of Karnataka, it came into existence in 2007 with the sheer hardwork of students from Indian Institute of Technology. It flagged off as an online portal for personalizing gift items and developed into a stylistic web portal with excellent amount of products on sale. Entering in to the world of online shopping, Jabong saw the daylight in 2012 and has been shipping extensive amount of orders every day. Founded by Praveen Sinha, Lakshmi Potluri and Arun Chandra Mohan, Jabong is an India fashion and lifestyle ecommerce portal. Selling footwear, apparel, fashion accessories, home accessories, beauty products and other lifestyle products, it has gained a special place in the heart of people. It was in July 2016 that Flipkart acquired Jabong and appointed Ananth Narayanan as its new CEO till date. Being a famous name on the shopper’s mind, Snapdeal has created a buzz with its qualitative products that are worth appreciating. As a Delhi-based company, it was initiated by Indramani Shukla and Rohit Bansal in February 2010. Talking about the existing marvel of the company, it has around 3, 00,000 sellers with over 30 million products accessible from 800+ diverse categories. The buyer’s bracket extends from over 125,000 regional, national as well as international brands and retailers to reach 6,000 towns and cities across the nation. Founded by Pierre Omidyar, Ebay is a multinational ecommerce portal that offers extensive number of products to choose from. Based in San Jose town of California city, Ebay facilitates online consumer-to-consumer and business-to-business sales. Today, its functional scenario is such that the company operates in more than 30 countries. With discounts and offers available, Ebay is quite an affordable option to shop online.